As Samsung officials continue to deny rumors of an upcoming premium variant of its flagship smartphone, the Galaxy S5, evidence is piling up which suggests a release is on the horizon. 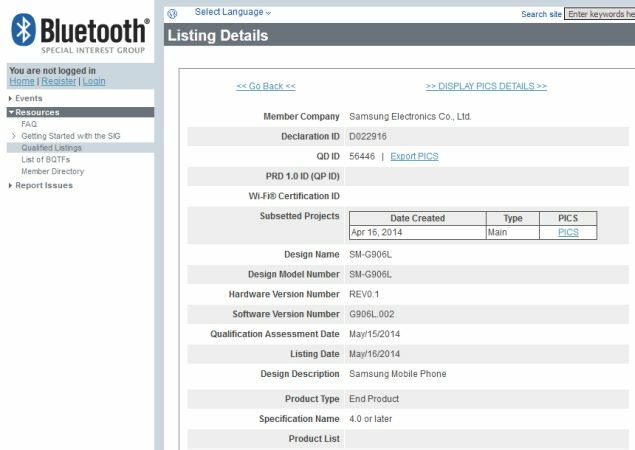 The latest evidence includes a screenshot taken from Bluetooth SIG’s website (see image above), showing the device build SM-G906. This, of course, is just one more sign pointing towards a premium, or Prime, variant of the Samsung Galaxy S5. Unfortunately, the Blutooth SIG screenshot doesn’t reveal any hardware or software specifications for the device. It only lists the device as being Bluetooth 4.0-compatible, which is pretty much a given with any Galaxy smartphone. How do we know that device build SM-G906 is the Samsung Galaxy S5 Prime? Everything is pure speculation at this point, but a Dutch website published the build earlier this year, claiming to have discovered it using Samsung’s official Find My Mobile service. The build, SM-G906, is the same found on the Blutooth SIG’s website, which would leave some people to believe that Samsung is working on the Prime variant with plans to release it in the near future. Of course, this isn’t the only instance of build SM-G906 being spotted. A Hong Kong website reportedly published the build but later took it down. While the listing was up, it revealed a Snapdragon 805 processor and 3 GB of RAM, making it slightly better than the current Galaxy S5. The website quickly took it down, however, creating even more speculation regarding Samsung’s intentions for a premium variant of its highly popular flagship smartphone. If Samsung does in fact release a premium Galaxy S5 variant, it would likely include a new processor. The current Galaxy S5’s processor is certainly capable of meeting users’ needs, but there’s still room for improvement. Rumors suggest that Samsung will ditch the current Qualcomm Snapdragon processor, replacing it with either an Intel or Samsung Exynos 5430 chipset. Will this boost the processing power of the Galaxy S5 Prime? It’s too early to make any definitive statements, but check back with our blog for all of the latest news and details surrounding the Galaxy S5 Prime! On a side note, there’s a strong possibility that Samsung will release two versions of the Galaxy S5 Prime. We’ve seen two builds floating around — SM-G906L and SM-G906K — which indicate there are multiple versions of the Galaxy S5 Prime. Do you plan on upgrading to the Galaxy S5 Prime? Let us know in the comments section below!